The concept of appointment television, where viewers had to schedule their lives around a specific broadcast time, is on the way out. Binge-watching television on streaming services is where it's at, and there's no reason you should have to halt your binge just because it's time to jump in the car. Even as viewership of traditional television sources falls, online viewership is on the rise. In fact, the 9th edition of Deloitte’s Digital Democracy Survey found that while cable and satellite television subscriptions remain the favorite method of television watching for Generation X, the Baby Boomers, and older folks, younger millennials have shifted focus almost entirely to streaming sources. Whether we're watching on the air, over the Internet, or anywhere else, the fact is that we're watching. Television viewership has even trended toward mobile devices in recent years, and Netflix has shown that binge watching is the new normal. It may seem like low hanging fruit, but physical media like DVDs and Blu-Rays still represent the easiest way to binge your favorite television shows on the road. Although research has shown that TV viewers strongly prefer renting content to buying physical media, there's something to be said for the convenience of grabbing a DVD or Blu-Ray box set on your way out the door. If you're feeling especially industrious, you can even slot your kid's favorite series into a low profile disc wallet and leave it in the car. While watching TV on DVD or Blu-Ray isn’t live, and it does involve lugging around physical media like some kind of caveman, in-car DVD players are extremely easy to come by these days. Or if you don't feel like buying new hardware, you could always plug an old laptop into a roof-mounted display and call it good. If live TV is more your style, it's actually possible to watch local broadcast television in your car. It's more work than popping in a DVD and calling it good, and you'll have to deal with interference from buildings and other vehicles, but that's all part of the adventure. To watch live broadcast television in your car, you'll need three things: an HD TV antenna that's capable of pulling in local stations, a display, and a tuner. The display and tuner are easy if you can find a 12V television to meet your needs, but the antenna can be a problem. To get the best results, you'll have to mount it on the exterior of your vehicle, which isn't for the faint of heart. While suction-mounted automotive HDTV antennas do exist, you'll probably have to do a little digging to find one. You'll probably get the best results out of a high quality antenna that's technically designed for RV use, but driving around with something like that on your roof may occasion funny looks from your fellow motorists. Unlike local broadcast television, yet much like satellite radio, you need a special mobile satellite antenna and a subscription if you want to watch satellite TV in your car. The main drawback is that you may not be able to get a signal if you’re surrounded by a lot of tall buildings, but the flip side is that you’re less likely to experience service interruptions if you head out on a long road trip where local broadcast television may not be available. Satellite dishes designed for use on vehicles are usually meant for RVs, but slimmer, flatter designs have broken into the market. This still may not be something you want on your roof, but it is an option. The wonders of cloud DVR mean that you may be able to watch your time-shifted shows on the road. The main issue is bandwidth, since you'll need some type of mobile data connection to make this work. Before you hit the road and start streaming, you'll want to do a little research into how your cloud DVR interacts with your data plan. Some providers treat different types of data differently, so you may or may not be in the clear. The other option is to grab your physical DVR and take it with you. 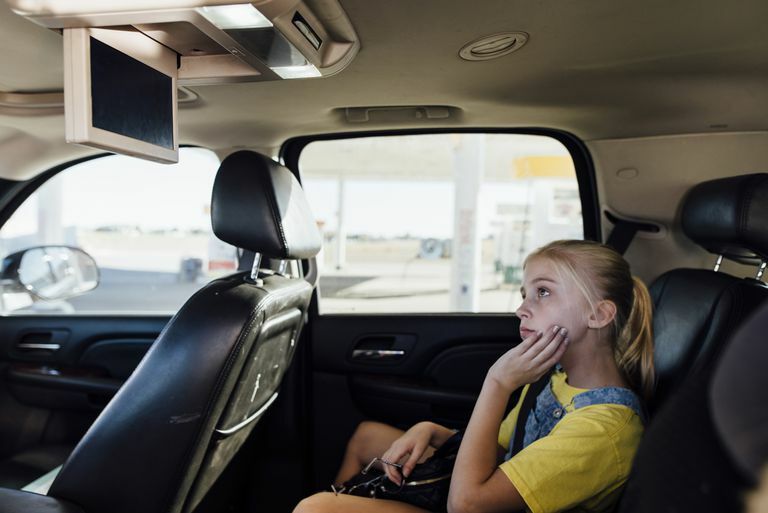 This involves wiring in an inverter and using your DVR in your car just like you would at home, so you'll want to make sure that it will actually function without being connected to cable before you head out. If you have cable television at home, or even an antenna, you can actually stream live television from that source to any internet-connected device. That means you can actually stream live television from your house to your car if you have the right equipment. Slingbox is one option that allows you to stream live television from your house to your car, provided that you have a mobile internet connection. This involves two main components: a Slingbox hooked up to your home cable or satellite connection, and a mobile Internet connection like a mobile hotspot or tethered smartphone. Plex is another option that you can use to stream live television on the road. This requires a cable subscription or antenna, a computer with an HDTV tuner card, and a subscription to Plex Pass. You can also use the same setup to stream movies and music from your home computer to your car. Streaming services also rely on a mobile Internet connection, and they can eat straight through your data plan, but they also provide the largest amount of content. Services like Netflix, Amazon Prime, and Hulu offer the best ways to binge watch your favorite shows while on a long road trip. Some streaming services even allow you to download a number of episodes to your mobile device, so you can watch them on the road even if you lose your internet connection. Other streaming services, like YouTube TV and Sling TV, allow you to watch live television via a data connection. These services can also use a lot of data, but they do represented a way to watch live TV without bolting a giant antenna on your roof.